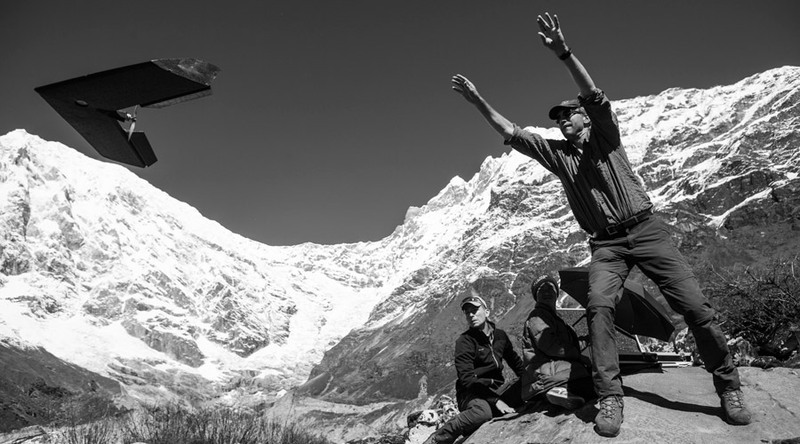 Launch of an UAV for a survey of the Lirung Glacier (4150 m amsl) in Nepal. Photo by Eduardo Soteras. The technology related to unmanned aerial vehicles (UAVs) has developed with a tremendous speed during the last few years. The technology has now matured and allows for scientific applications in various fields and it can be used as a pathway to climate innovation. Professional UAVs are now on the market that have a huge scientific and commercialization potential. In this project the development of new approaches are intended where UAVs are used to monitor the direct impacts of climate change on glaciers in Europe and in the Himalayas. The glaciers in Europe are well documented and will serve for validation of the developed methodologies while the study in the Himalayas will greatly improve our scientific understanding of the complex hydrology in this area. The hydrology of the greater Himalayas is complex due to intricate monsoon dynamics, the varying dependence on snow and glacier melt, the lack of data and the inaccessibility of the terrain. Yet, the greater Himalayas are a source of water to over 1.5 billion people and changes in the water resources of the source areas of Asia’s main rivers is likely to have a great impact on society. Moreover, the complex terrain and the changes in climate may cause more a frequent occurrence of natural disasters such as landslides and flash floods from heavy precipitation and glacier lake outbursts. There is great scientific debate about the response of Himalayan glaciers to climate change in Asia. Most Himalayan glaciers are seemingly losing mass at rates similar to glaciers elsewhere, but the processes are poorly understood, caused by lack of data and the limited amount of studies. Surface features of the glacier tongues such as the presence of debris, supra-glacier lakes and ice cliffs may play an important role. To overcome the uncertainty about the Himalayan glaciers due to the data scarcity we aim to make a significant advancement by using UAVs to quantify melt rates, surface properties and flow velocities of glaciers. As the project is a PhD project multiple studies within the same framework are performed over the course of the project. In a pilot study Lirung Glacier , which is located at ~4100 m above sea level in the Langtang Catchment in Nepal, was monitored using a Swinglet CAM UAV in both May and October 2013. This study was the lead up to the IceSpy project. The hundreds of images taken during the surveys were processed into digital elevation models (DEMs) and orthomosaics, i.e. geometrically corrected stitched images. By comparison of the May and October datasets the changes of Lirung Glacier over the 2013 monsoon season were measured precisely. It was found that the average surface lowering over the monitored area was small with ~1.1 m. However, a large spatial heterogeneity is present on the glacier with high dynamics near ice cliffs and supraglacial ponds. Over the course of the monsoon some cliffs completely changed their morphology and have backwasted considerably. In terms of velocity we have found that it is very limited and have reduced about a factor two with estimates and measurements made in the mid 90s by Naito et al (1998). Immerzeel, W. W., Kraaijenbrink, P. D. A., Shea, J. M., Shrestha, A. B., Pellicciotti, F., Bierkens, M. F. P., & de Jong, S. M. (2014). 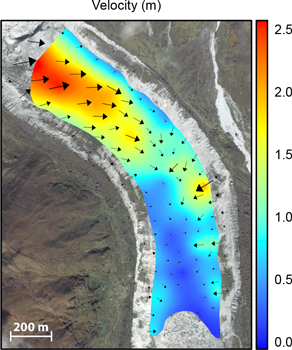 High-resolution monitoring of Himalayan glacier dynamics using unmanned aerial vehicles. Remote Sensing of Environment, 150, 93–103. Measuring seasonal variation in flow. 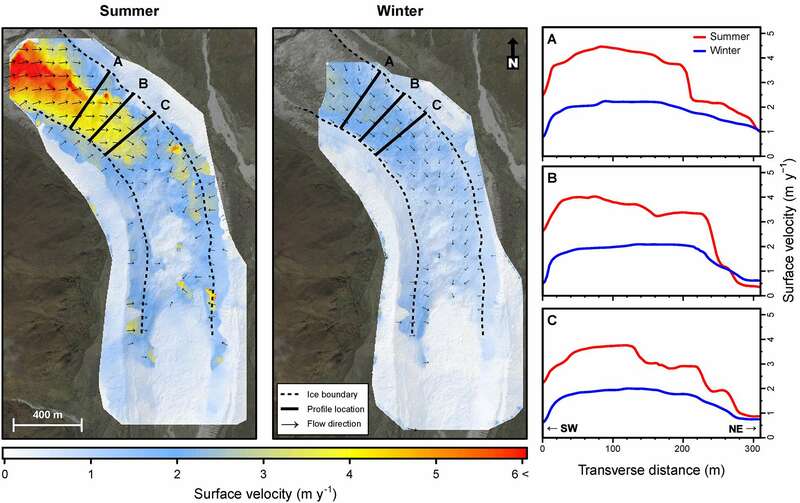 A study published in a special issue of the Annals of Glaciology reveals seasonal differences in velocities of Lirung Glacier in detail using cross-correlation feature tracking of imagery from an unmanned aerial vehicle (UAV).The glacier has considerable spatial and seasonal differences in surface velocity, with maximum summer and winter velocities 6 and 2.5 m a–1, respectively, in the upper part of the tongue, while the lower part is nearly stagnant. 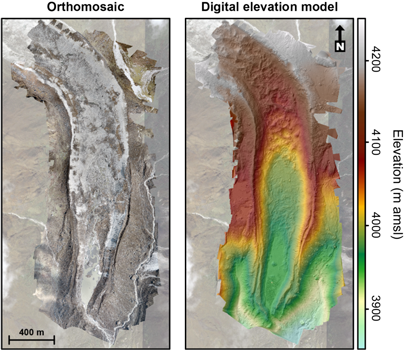 UAVs have great potential to quantify seasonal and annual variations in flow and can help to further our understanding of debris-covered glaciers. Surface velocity and flow direction obtained by noise-filtered frequency cross-correlation for the summer (left) and winter (middle) period. The plots on the right show transverse surface velocity profiles for both seasons taken at the three indicated locations. Kraaijenbrink PDA, Meijer SW, Shea JM, Pellicciotti F, Jong SM, Immerzeel WW (2016). 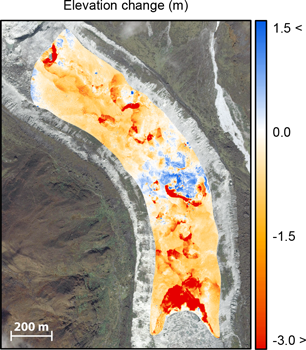 Seasonal surface velocities of a Himalayan glacier derived by automated correlation of unmanned aerial vehicle imagery, Ann. Glaciol., 57(71), 103-113.